If you grew up in a small town like Round Top, Texas, you remember the Christmas parades that delighted young and old alike every holiday season. The homemade floats, the gathering of friends and the priceless memories are what makes the concept of a Christmas parade nostalgic for so many. Compared to Christmas parades held annually in large cities like New York and Philadelphia, small town parades are obviously less polished and extravagant. But the reasons that they are held every year are far from notoriety or glitz and glamour. For these small town parades, it’s all about tradition. The small-town Christmas parade is about a gathering of family and community, and the creativity and giving spirit of that community. Round Top is a small town, which means it’s also a place deeply rooted in its traditions and values. 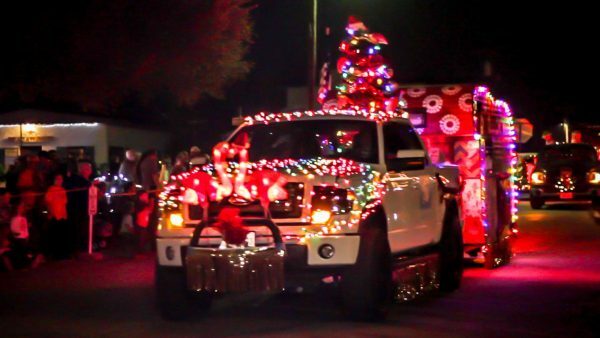 So the town came together in 2017 to create a new holiday tradition – the Round Top Lighted Christmas Parade & Street Dance. This year’s parade will be held on December 1, and it already has all the trappings of a small-town tradition, despite the fact that it’s only in its second year. The day’s festivities start off with breakfast with Santa at Royers Café starting at 8 a.m., and the Farmers and Artisans Christmas Market will be open in the town square from 9 a.m. – 3 p.m. Old and new traditions merge with the 21st annual Round Top Historical Society Tour of Homes running from 11 a.m. – 5 p.m. This year there are seven homes on the tour, most historic, others unique. Of course, no day in Round Top would be complete without holiday shopping at our local stores (most stores will be open late on the day of the Christmas Parade). The rest of the day is jam-packed with family fun activities like a children’s Christmas concert at Henkel Hall, visits with Santa at the town square gazebo, food and drinks and of course, the lighted Christmas parade and street dance to top off the night. Expect to have the most wonderful time you’ve had all year, and make plans to keep the tradition going! For more information and for tickets to specific events, visit exploreroundtop.com/christmasparade.